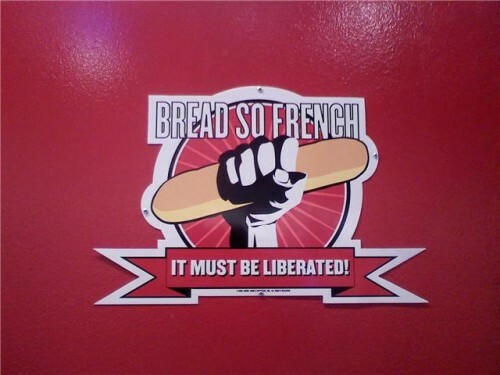 Bread So French… It Must Be Liberated! I saw this at Jimmy John’s and lol’d. Now you guys can lol, too. I don’t get the thing about France and surrendering. @NotMe: It’s hard to think of one solid, lasting French military victory. Even their best, Napoleon, tried to invade Russia. @DCR: Well, there was that time that they took over 1/4 or more of Africa and also a big chunk of southeast Asia for 150 years. But I suppose you’re going to say something about Asians and Blacks now. I’ll put it this way. Once upon a time the Kingdom of France was about the size of Paris + outskirts. A lot of the most powerful kingdoms of the middle ages vanished in the face of French expansion. You know what I always liked about WWII? France covered one flank really well. So Germany invaded Poland to go around. The French are particularly proud of their cowardice, this is why they are known here in England as “cheese eating surrender monkeys”, a phrase used by Willie in the Simpsons one time as I seem to remember. @Caio: I think that was more the work of the Gauls than the French of recent ages. @DCR: I was going to say William taking England in 1066, but he and the Normans were what, 2nd or 3rd gen viking settlers? They held on to England (on and off) for quite a long time. I always figured that was the reason for England’s enmity toward them.